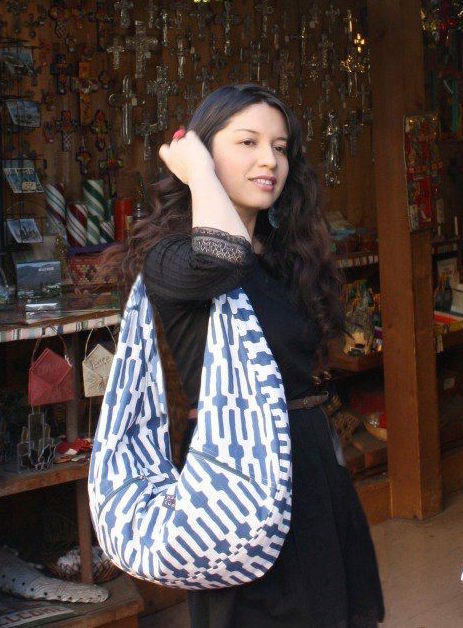 BOHO MARKET: Giveaway Alert! Two Adorable Necklaces! Giveaway Alert! Two Adorable Necklaces! I'm so glad to host this wonderful giveaway! Thanks to darling Kelly from the lovely blog Kelly Berkey Designs; she's giving away two adorable necklaces perfect for Valentine's day! She has gorgeous pieces on her Etsy shop as well! 1. Visit Kelly's blog: Kelly Berkey Designs and become a follower, then go to her Etsy shop from there and pick your favorite piece, then come back here and leave a comment letting me know which one you chose. 3. Only 1 comment per person. This is a worldwide giveaway! Yayy! You can leave your comment until next Monday, Feb. 8th at noon. I'll announce the winner on Friday (Feb.12th) Thanks and good luck to everyone!! Me siento muy contenta con este lindo giveaway gracias a mi querida amiga Kelly del blog Kelly Berkey Designs; ella esta sorteando dos hermosos collares perfectos para San Valentin! Hay muchas cosas lindas en su Etsy shop también! 1. Ir al blog de Kelly y hacerte seguidor (ra) aqui, luego desde su blog entra a su tienda en Etsy y escoge la pieza que mas te guste, regresa aqui y dejame un comentario indicando cual escogiste. 3. Un solo comentario por persona. Todos pueden participar no importa en que país estés! Sii!! Tienes hasta el próximo Lunes 18 de Febrero al mediodía para dejar tu comentario. Anunciare al ganador(ra) el Viernes 12 de Febrero! Gracias a tod@s por participar y mucha suerte! "Hold Your Heart in Mine Necklace"
Perfect for you beloved one! Perfect for a Gypsy Boho girl! I have mine already and love it! Thank you so much for hosting this for me!! I'm so excited to hear from all your readers as to what pieces of mine they like best!! You are wonderful my dear friend! These are just precious! 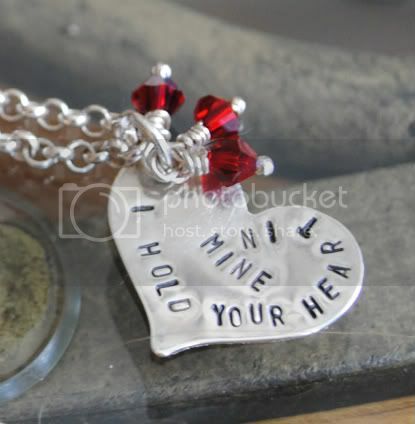 boho girl pendant is my favorite, followed closely by the i hold your heart in mine...sweet sentiment!! I want to participate in the giveaway. I loved the Goddess Love Necklace, the one with the face of a Beautiful Woman, I think a great idea is to have many pendants with different faces like this hanging in a bracelet, it surely be a conversation piece and a work of art. Love your art Kelly, I wish you all the success !!! Thanks for the opportunity. Que lindos collares! ya me hice seguidora de Kelly y la pieza que mas me gusta de ella es el Swarovski Crystal Falling Flowers Necklace! I love Kelly's designs, such talent :-) My favorite is Mother's Love followed by I hold your heart. absolute follower of you two beautiful souls!! i love everything Kelly does but since I have to pick one...i would choose "Boho Girl"....i feel i am one at heart!! loving the goddess love necklace. they are ALL wonderful but i.m liking the reddish hair in the beautiful goddess. maybe i should go back. This one is absolutely gorgeous! =) I reeeeeeally awant this necklaces =P hahaha! Hi there I have been following Kelly's blog for quite some time now and I'm so glad to have found yours too. I just love her stuff and found it almost impossible to choose one as a favourite but I think I've narrowed it down to 'Bloom' or 'Artist' necklace!!! Kelly's jewelry is so cute! I recently became a follower of Kelly's..love her work! My favorite from her Etsy Shop is the 8X10 "Siren Of The Sea" collage canvas. I'm an artist, and always enjoy the style of other artists. Kelly is multi-talented and I'm so pleased to have found her through this wonderful new venue of blogging. Hello again! =) i love your blog, esta genial, me encanta el estilo, ojala que en este giveaway tenga suerte !! :D me gusto el Be my valentine MEMORY COUPLE with nameplate engraved watchdial , gracias por la oportunidad, exitos! Bloom Necklace and Matching Pearl Earrings is my favorite! I'm a follower of both you and Kelly now. My favorite is the "I hold your heart in mine" necklace! I love them all but my favorite is the Goddess Flower Power Necklace. I'm following Kelly's and Boho Market blog. My fave piece of hers is "Live life inspired necklaces"! I've been reading both blogs for some time, they're awesome! 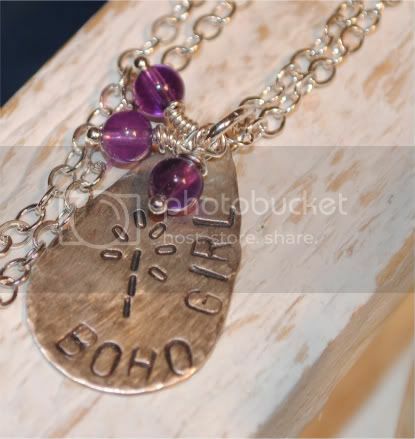 My favourite necklace of them all would have to be the 'Boho Girl' necklace, it's so beautiful! My favorite is the I Hold Your Heart In Mine Necklace, and I'm a follower of both blogs. I follow both blogs and I have to say that my favourite item is the bloom necklace with matching pearl earrings! but the Baby Baubles of inspiration is super cute too! You are both so creative and lovely! I adore the boho girl necklace! i like the Mother's Love Necklace. Qué bonitos todos! No conocía a la chica pero ya me he hecho seguidora. :) A tí ya te seguía, me encanta tu blog! Me encanta el de Live Laugh Love (http://www.etsy.com/view_listing.php?listing_id=37521960), es simplemente genial (gorgeous!). LOVE the live laugh love necklace. I love the goddess love necklace! so pretty! Giveaway Alert! Adorable Boho earrings! Two Winners and a Lovely Picture! In Love With Blanco Sp 2010!